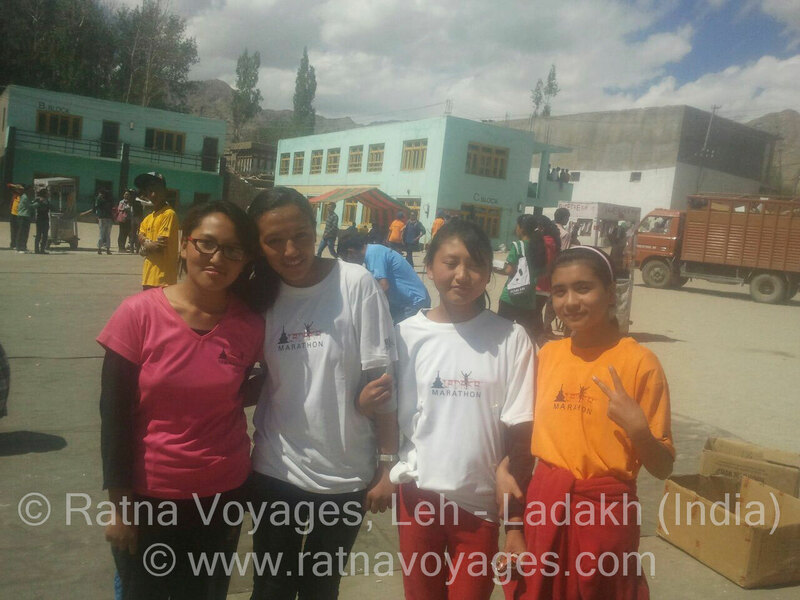 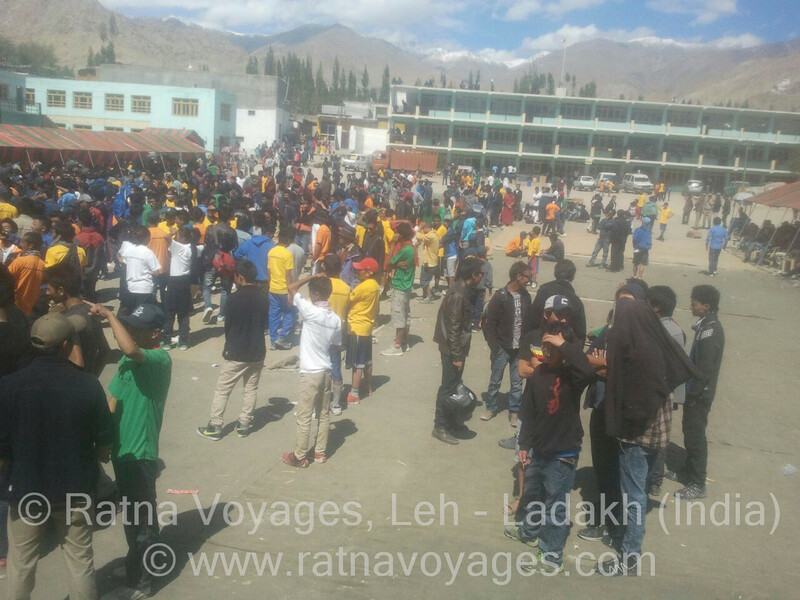 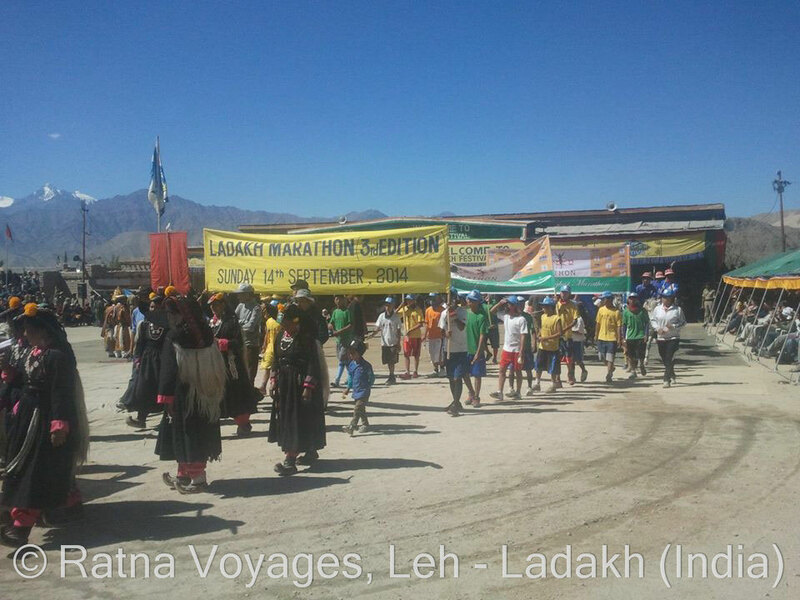 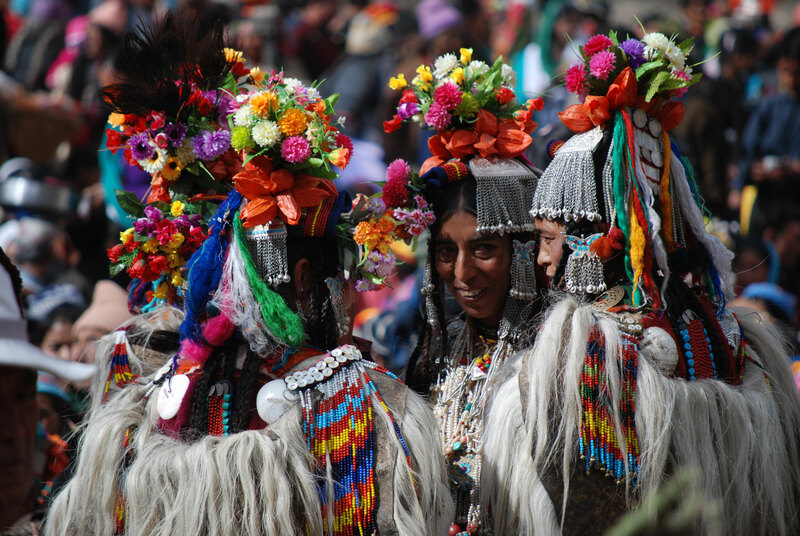 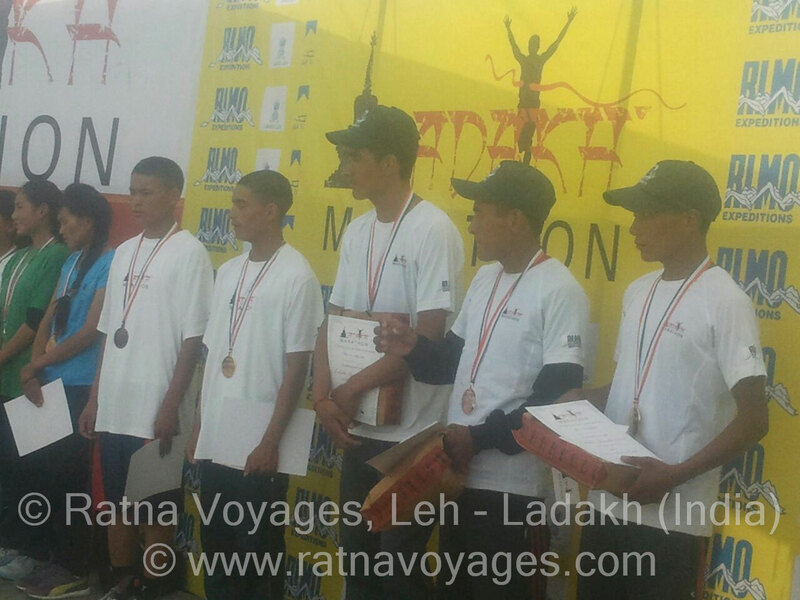 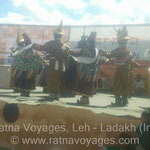 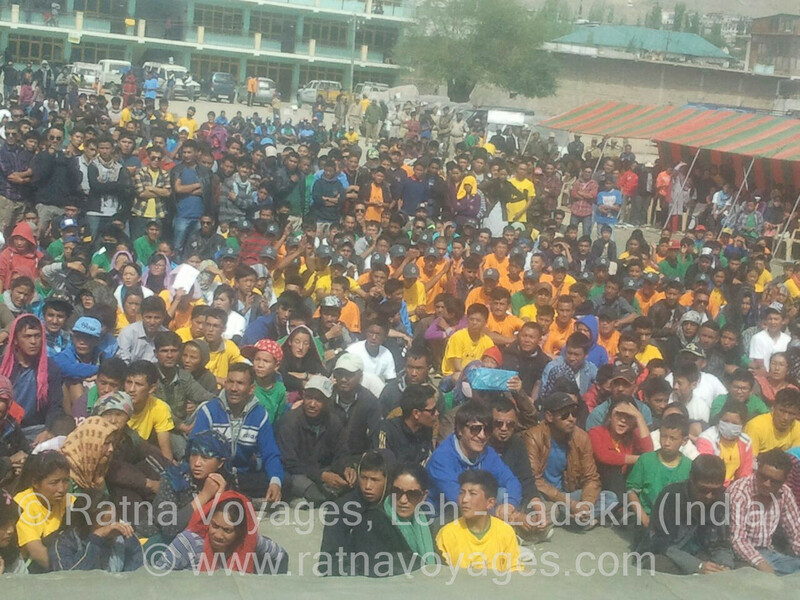 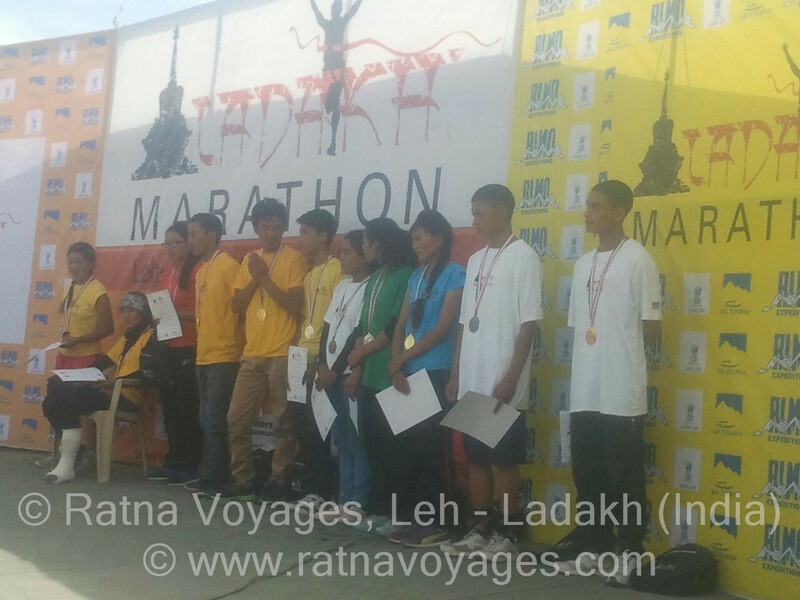 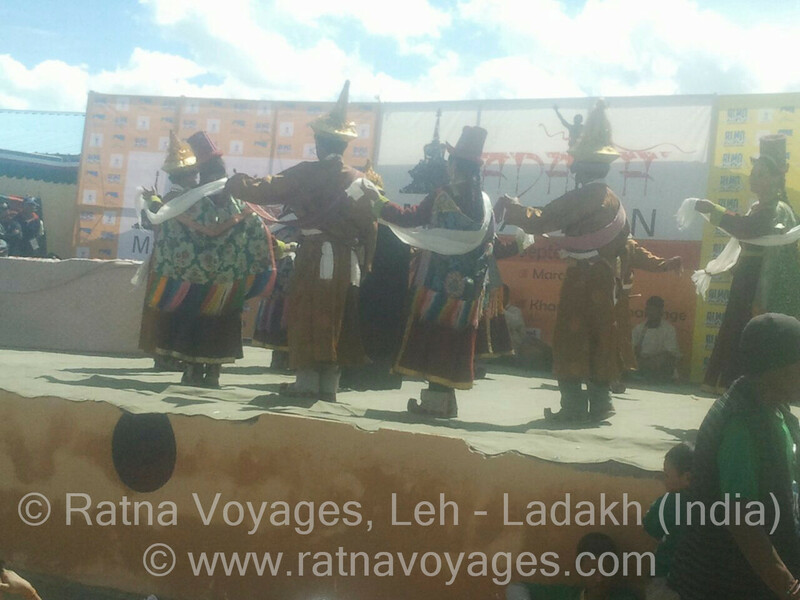 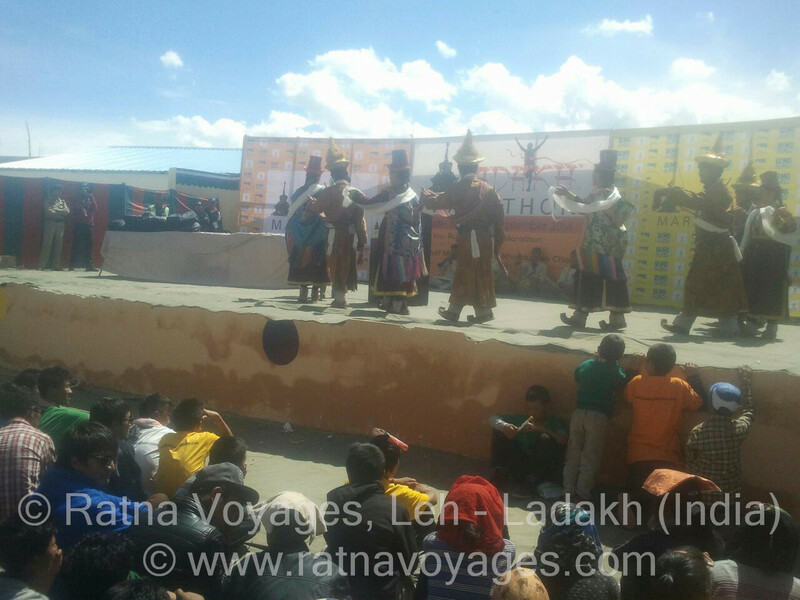 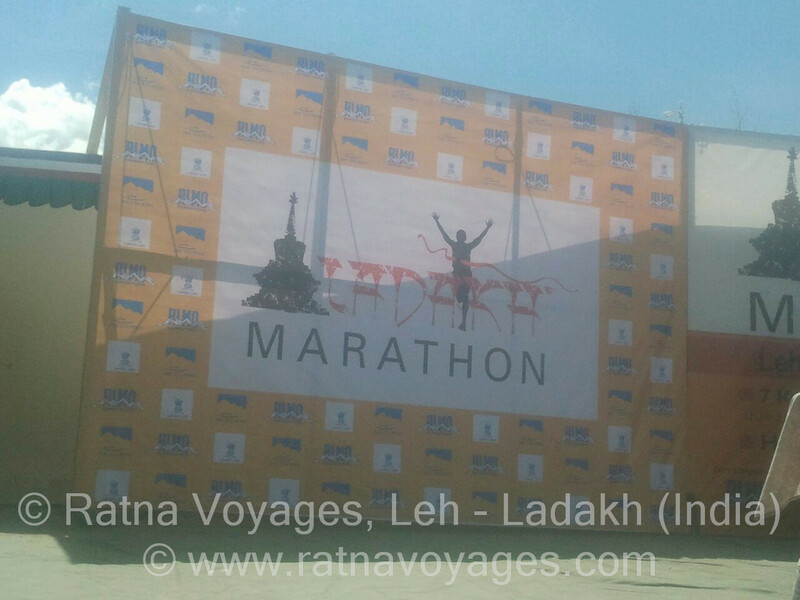 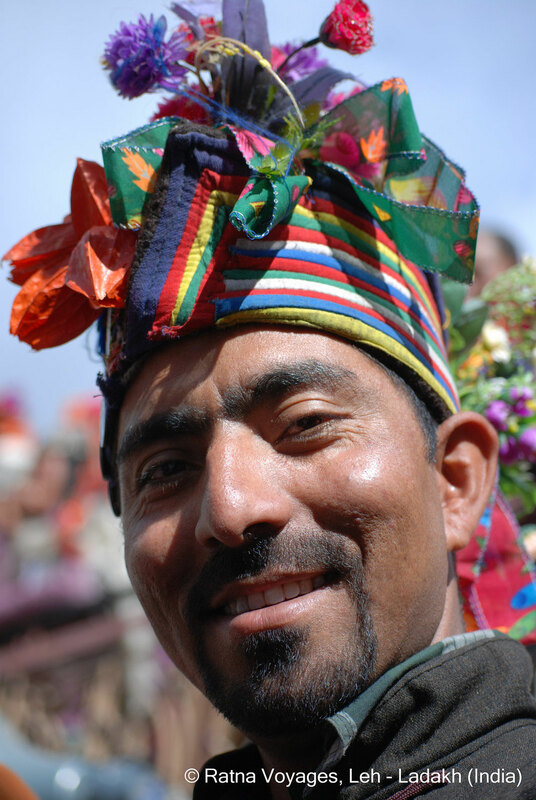 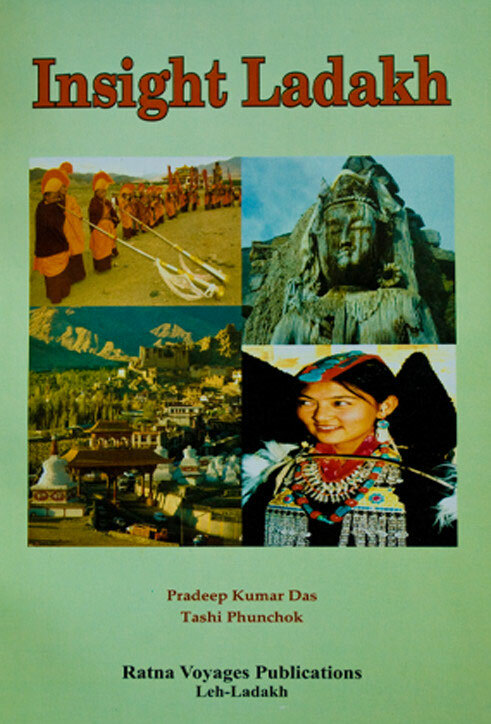 8TH LADAKH MARATHON: SUNDAY, 8TH SEPTEMBER 2019 - RATNA VOYAGES: Incredible India - Incredible Ladakh! 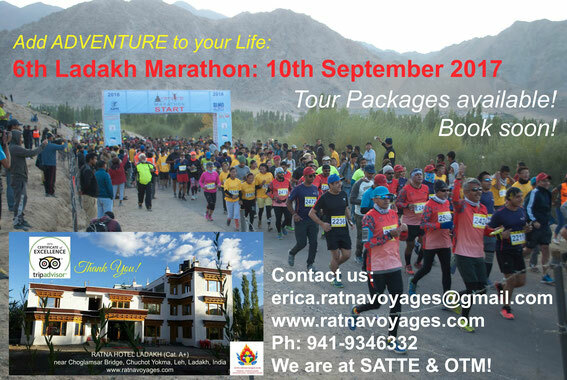 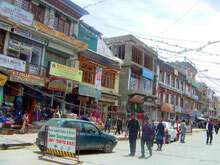 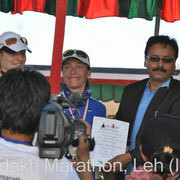 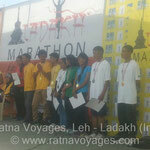 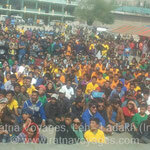 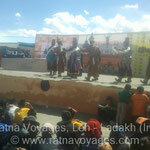 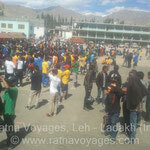 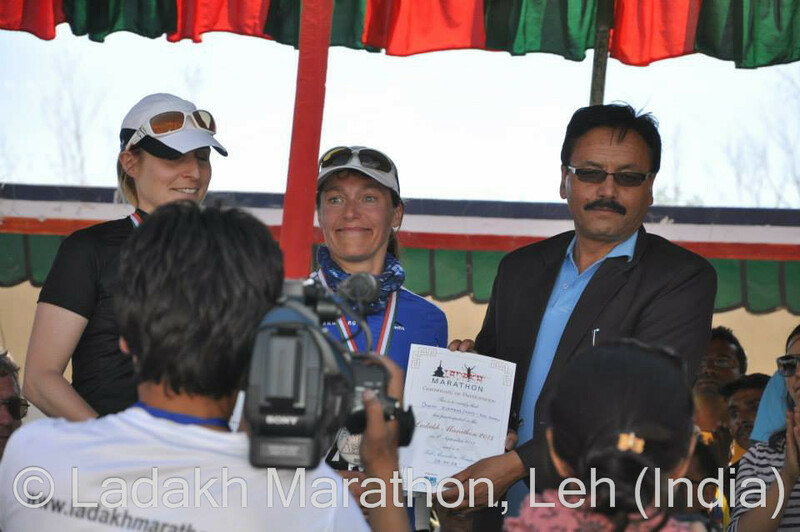 Our hotel "Ratna Hotel Ladakh" is located on the Full Marathon track and an official recommended accommodation. 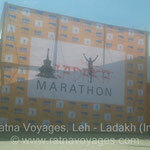 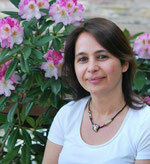 We organize complete Marathon Packages with proper acclimatization and sight-seeing. 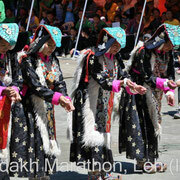 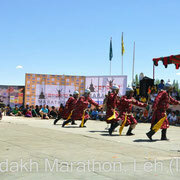 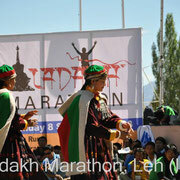 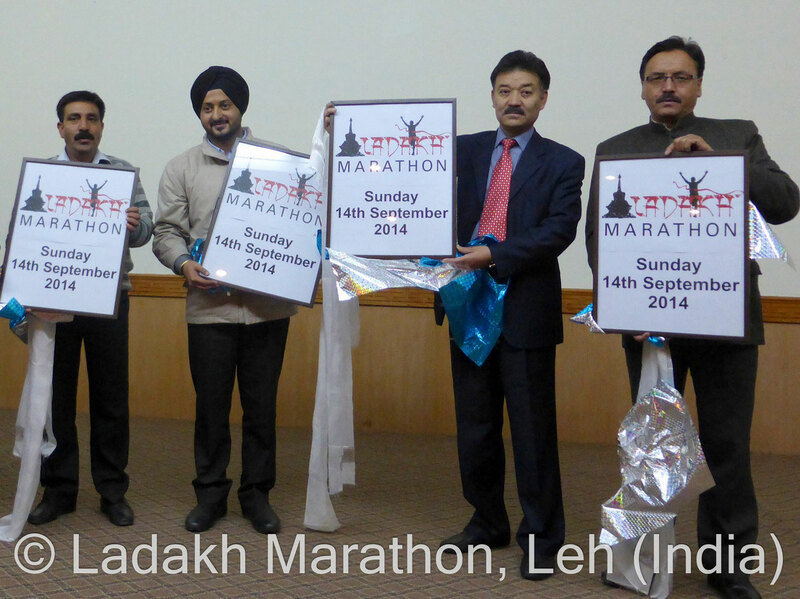 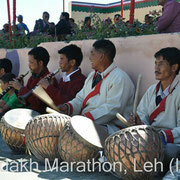 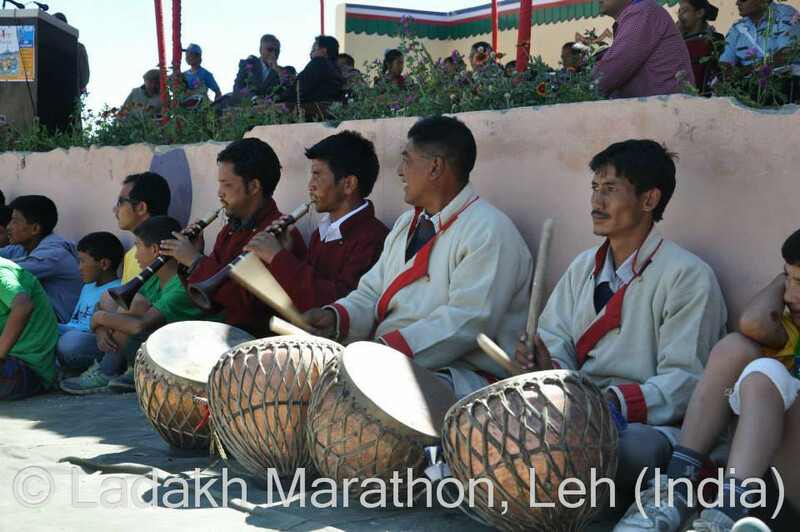 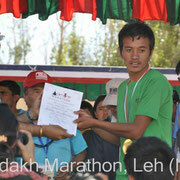 The Ladakh Marathon is the World's highest Marathon at 3500mts / 11,500ft. 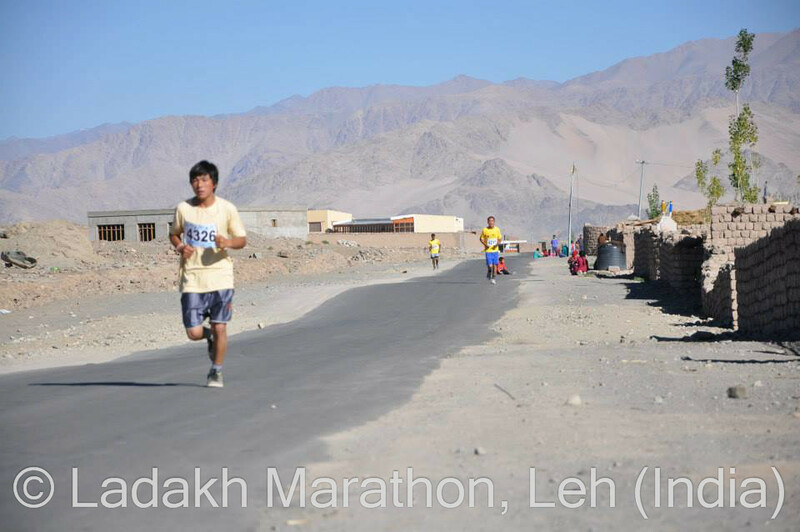 The race begins and ends in Leh, the historical capital of Ladakh, taking you through the outskirts and the stunning Leh Valley where the race track crosses the Indus River several times. 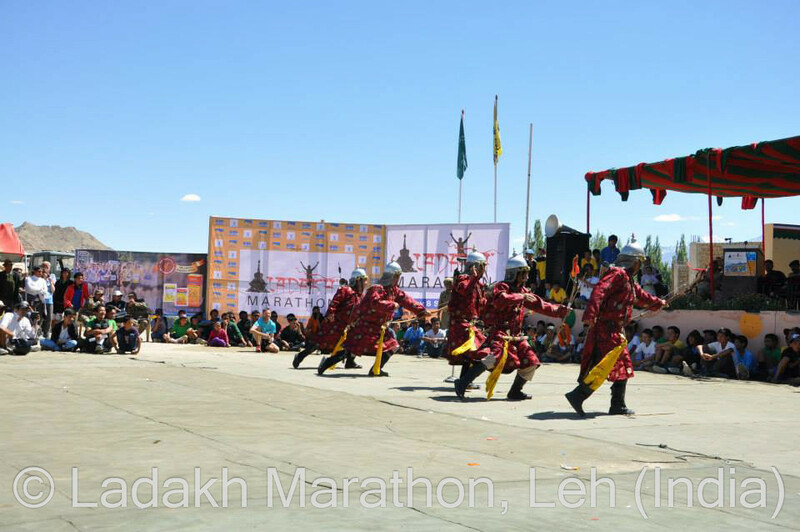 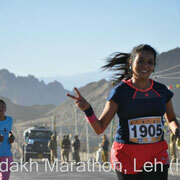 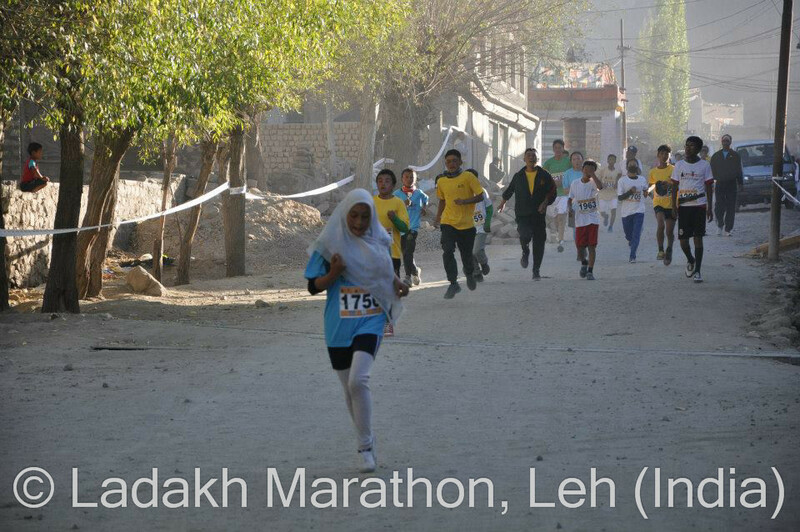 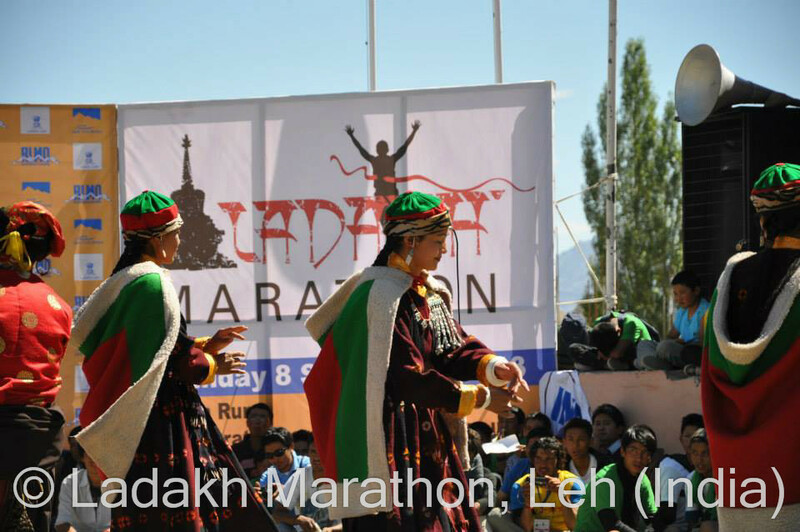 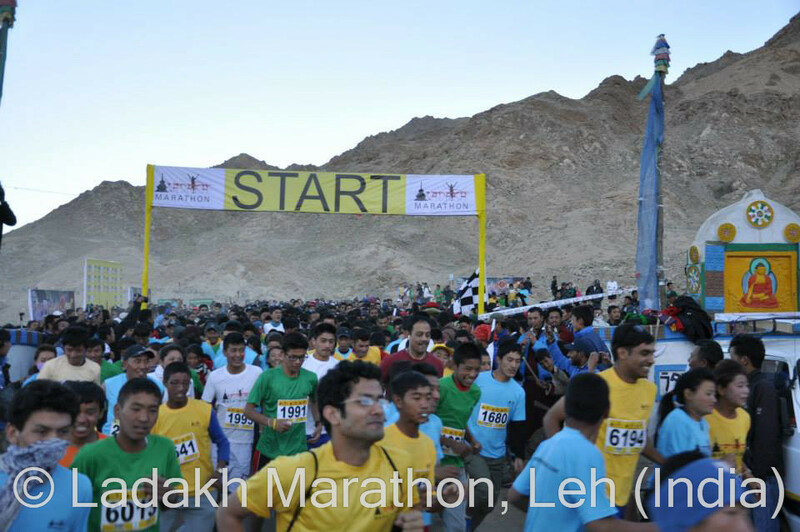 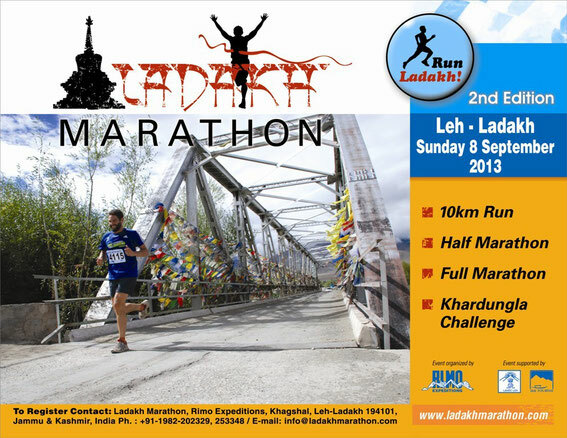 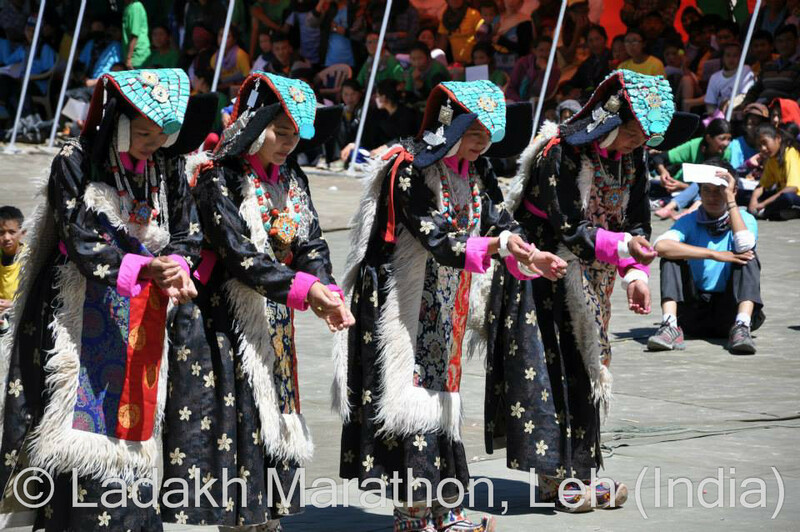 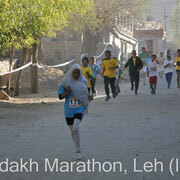 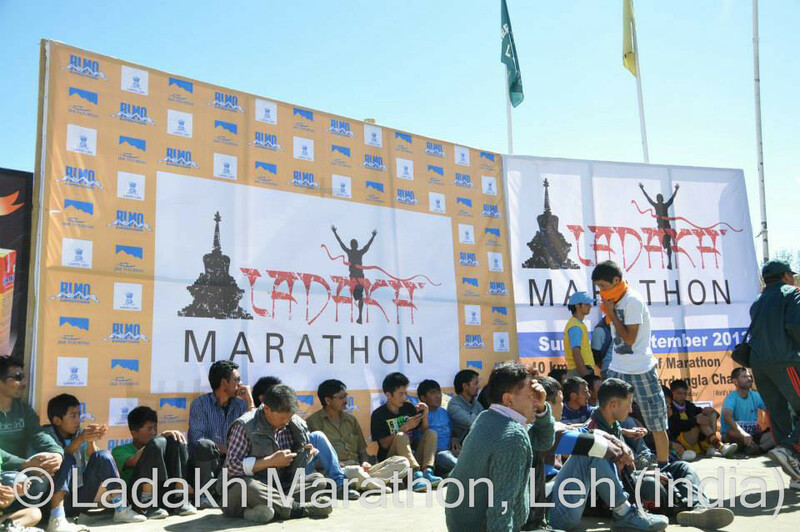 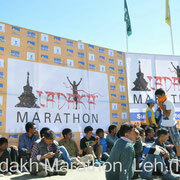 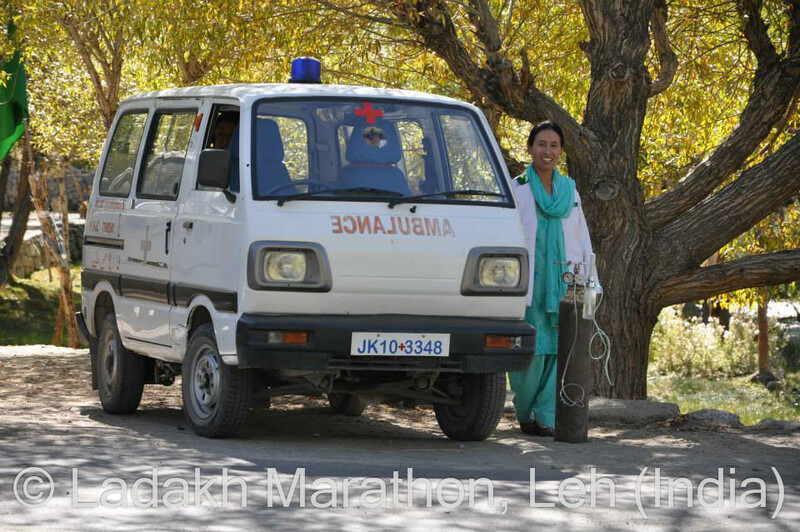 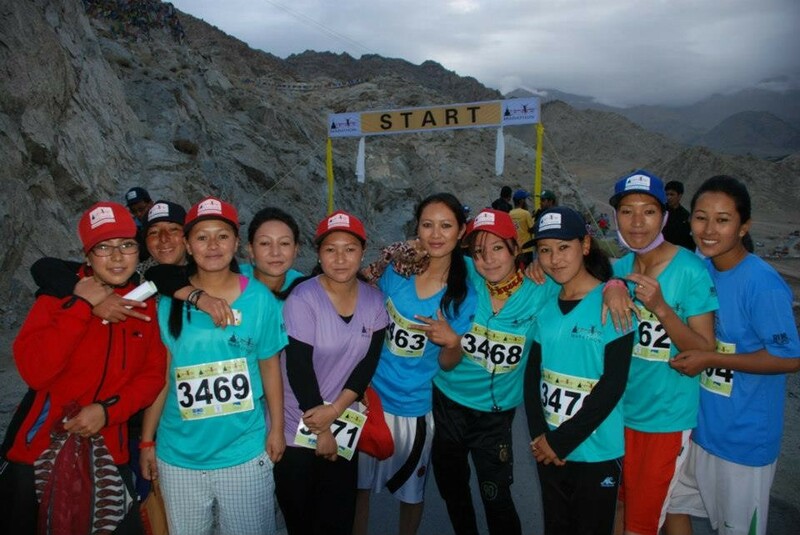 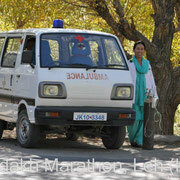 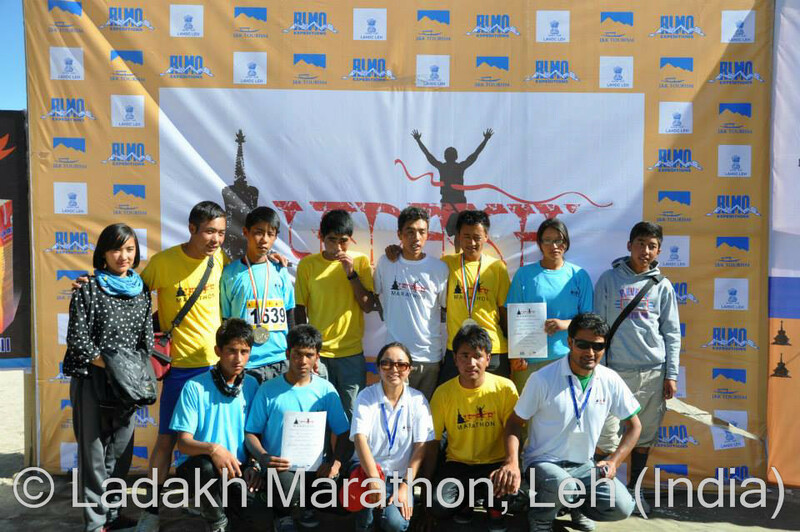 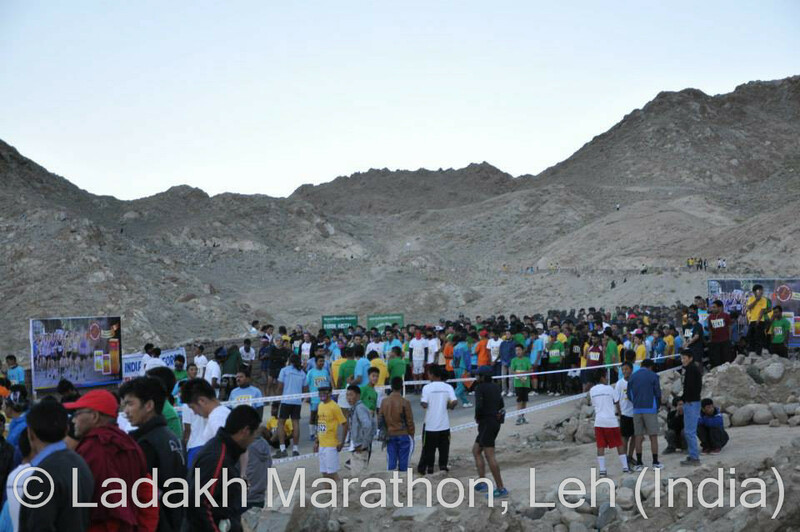 Contact us now to organize your personal Ladakh Marathon experience! 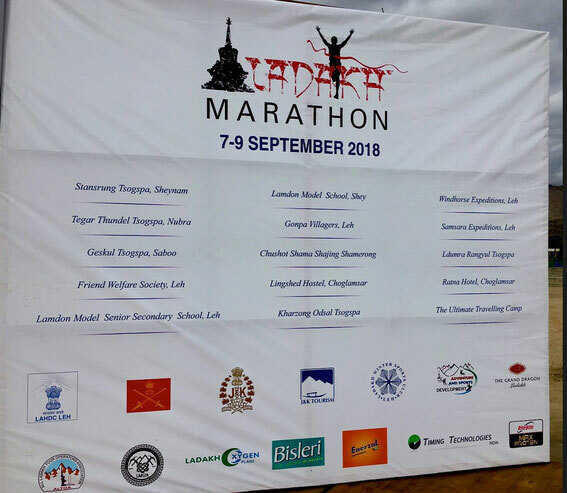 We personalize your program including appropriate acclimatization prior to the race (Pangong Lake, Tsomoriri Lake, or Stok Kangri trek & expedition), Marathon participation, and Ladakh sight-seeing before and after the race. 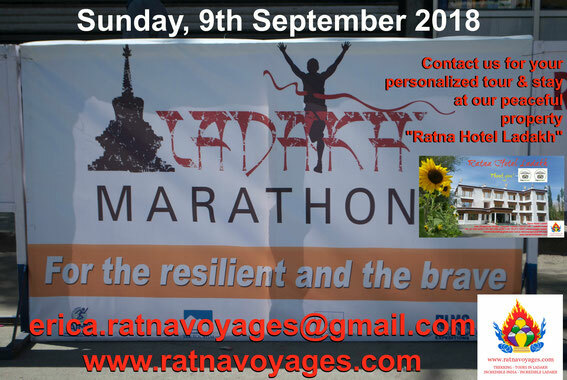 Our own new hotel "Ratna Hotel Ladakh", located in Chuchot-Choglamsar on the race track, will be your comfortable home and oasis of tranquillity and relax. 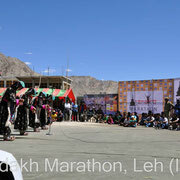 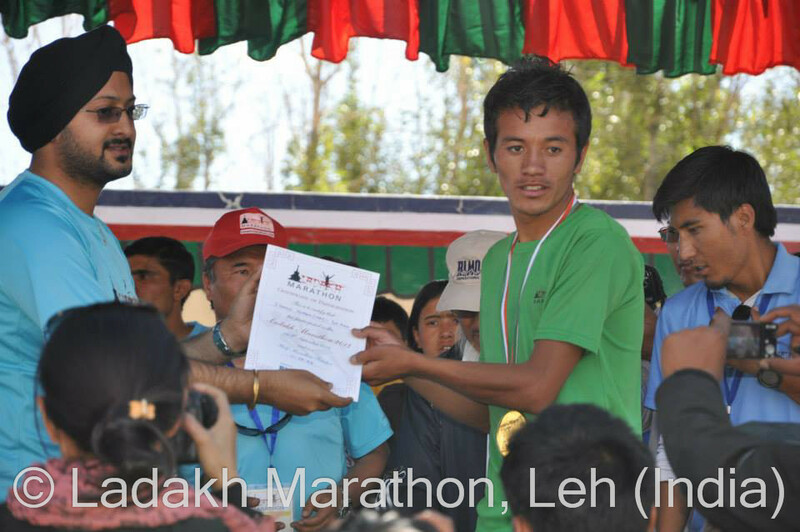 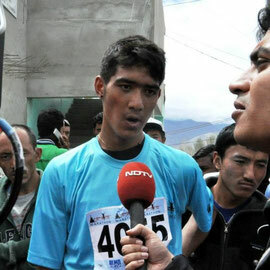 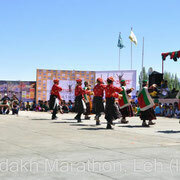 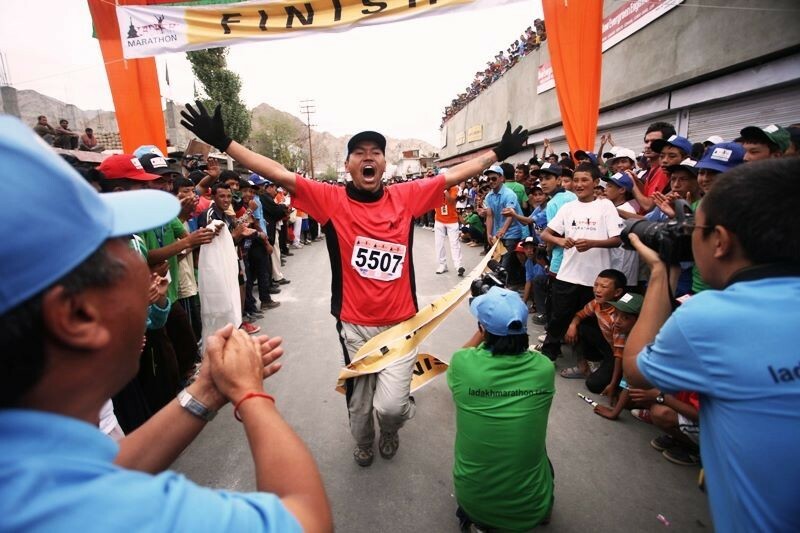 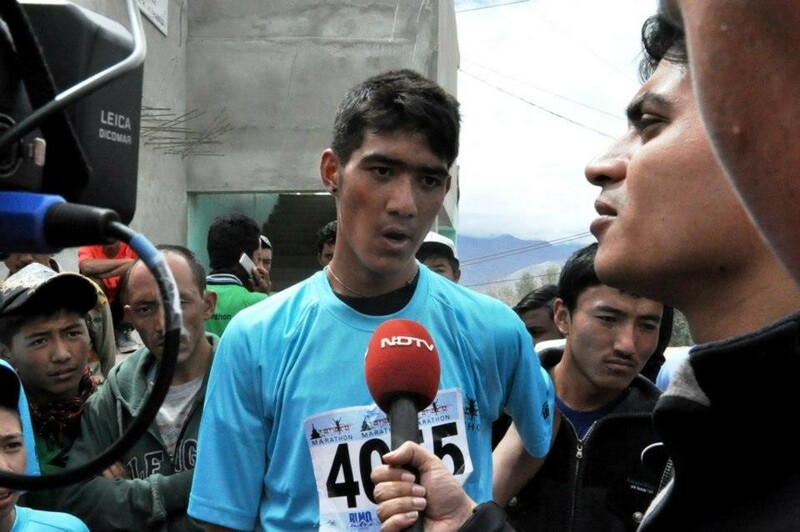 The Ladakh Marathon (42.1 KM.) 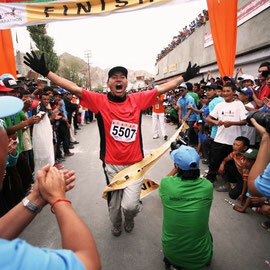 is the world’s highest marathon. 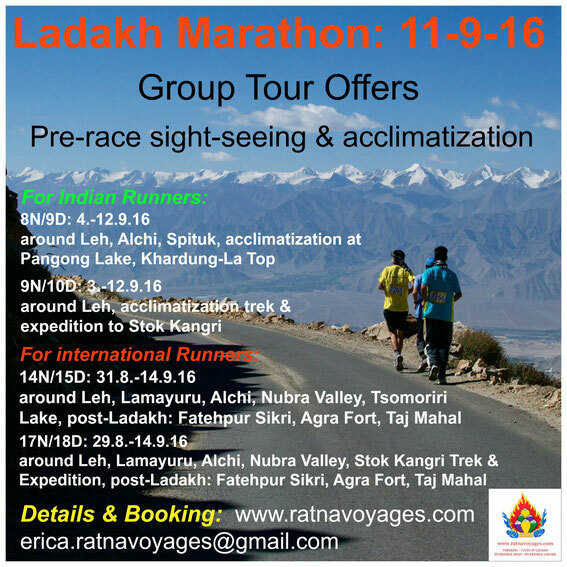 If you are a serious long distance runner this is one course you will want under your belt and be talking about for a long time to come. 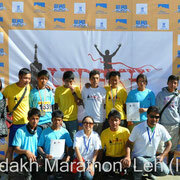 Our heartily congratulations to all Runners and Winners! 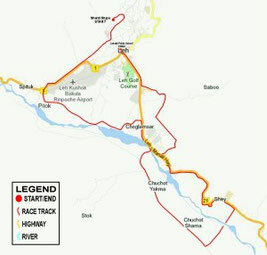 The 42.1 km. 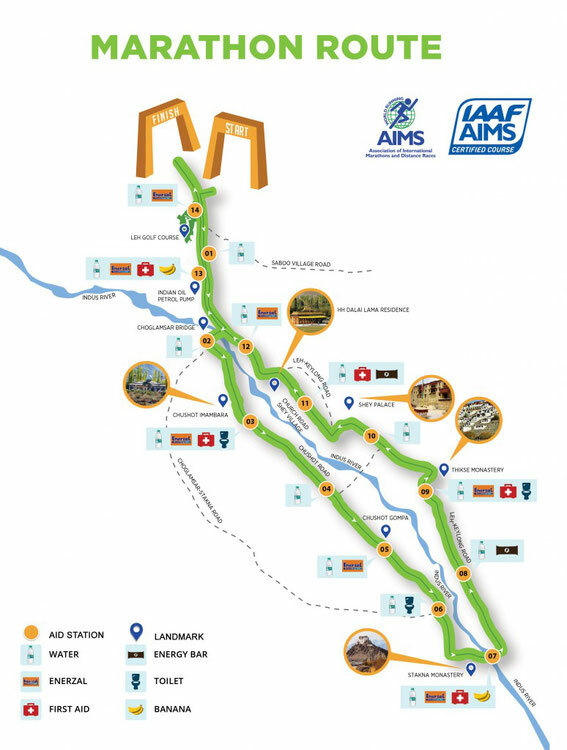 course veers west to Changspa, loosing elevation as one proceeds towards the Army Officer’s mess and Army general hospital and the Leh Airport. 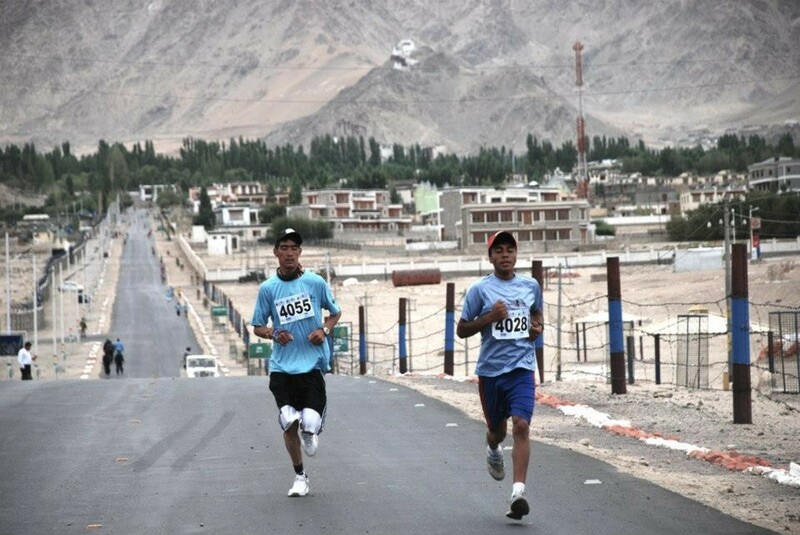 Runners then go past the Hall of Fame from where the race heads for Spituk Gompa, passing through the village of Spituk crossing the mighty River Indus. 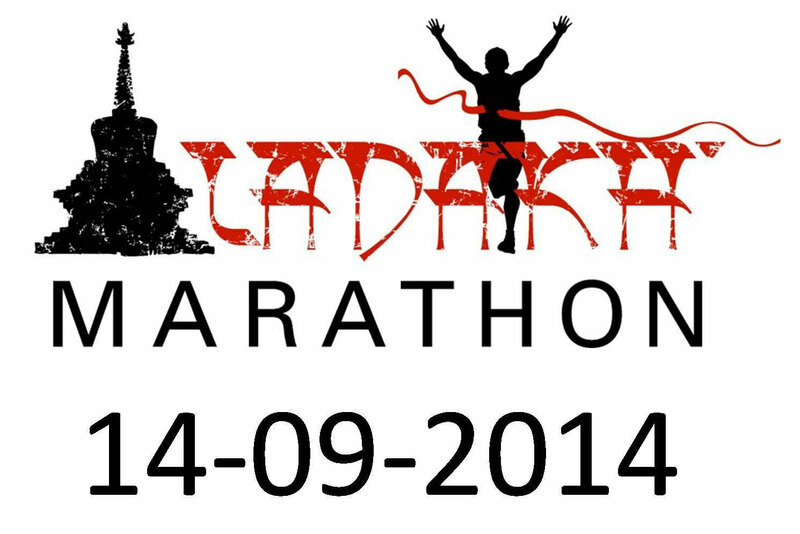 After this, the race passes the village of Palam, where pretty fields of barley welcome you. 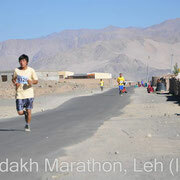 Then the run takes you past another pretty village named Chuchot. 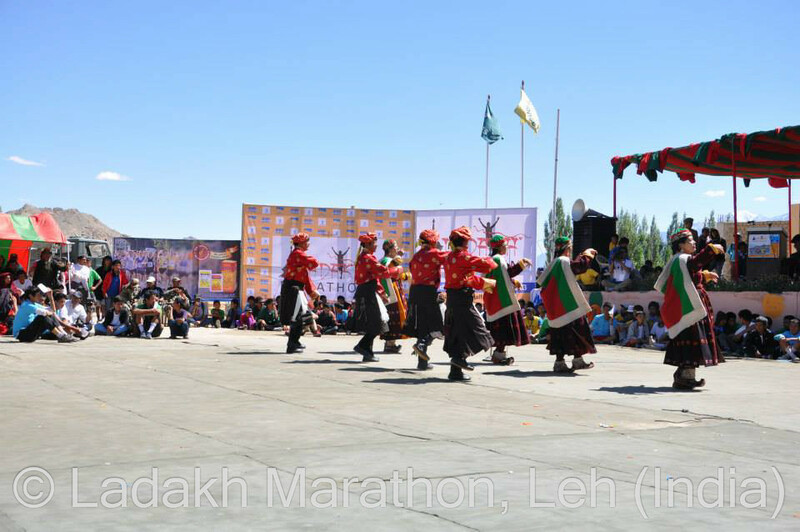 From here we get magnificent views of the Stok Range and the Indus Valley. 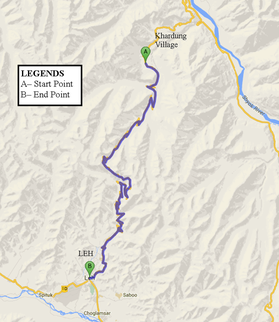 Heading south towards Shey, we take a loop just before the Shashi Bridge at Chuchot. 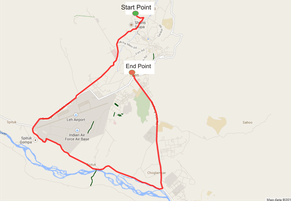 Passing through the village of Chuchot, the course is lined with Willow and Poplar trees as we continue to the village of Choglamsar where we again cross the River Indus. 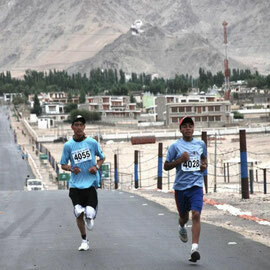 From here the course gradually ascends and passes the summer residence of H.H. 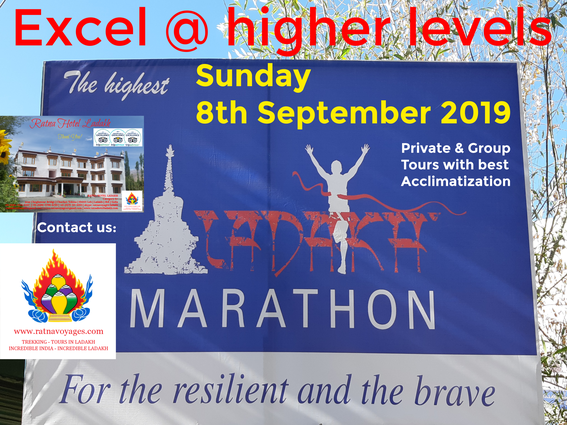 The XIV Dalai Lama and the Mahabodhi campus. 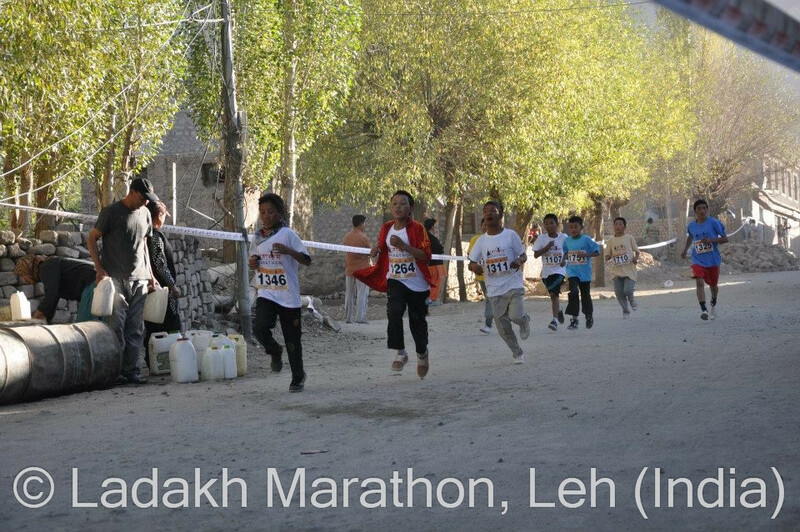 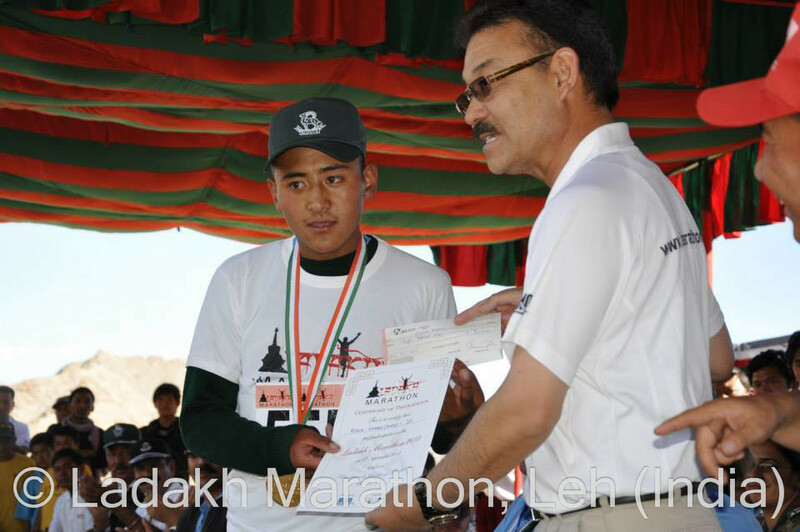 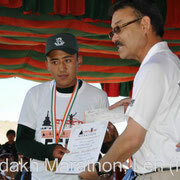 After this the final 2km run is on the Leh-Manali highway before finishing at the Ladakh Public School. 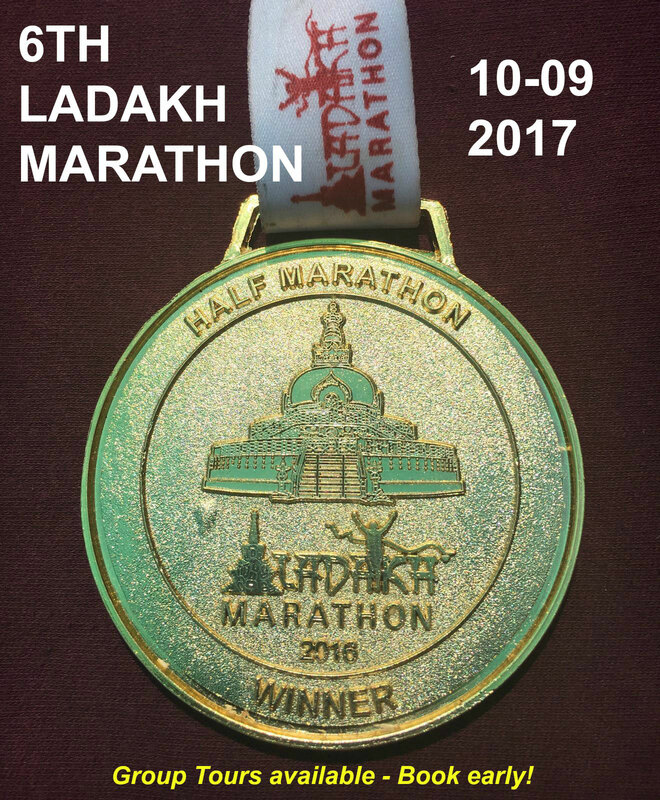 The Half Marathon (21.1 Km. ) 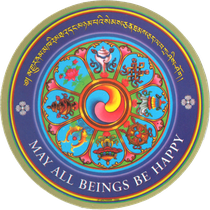 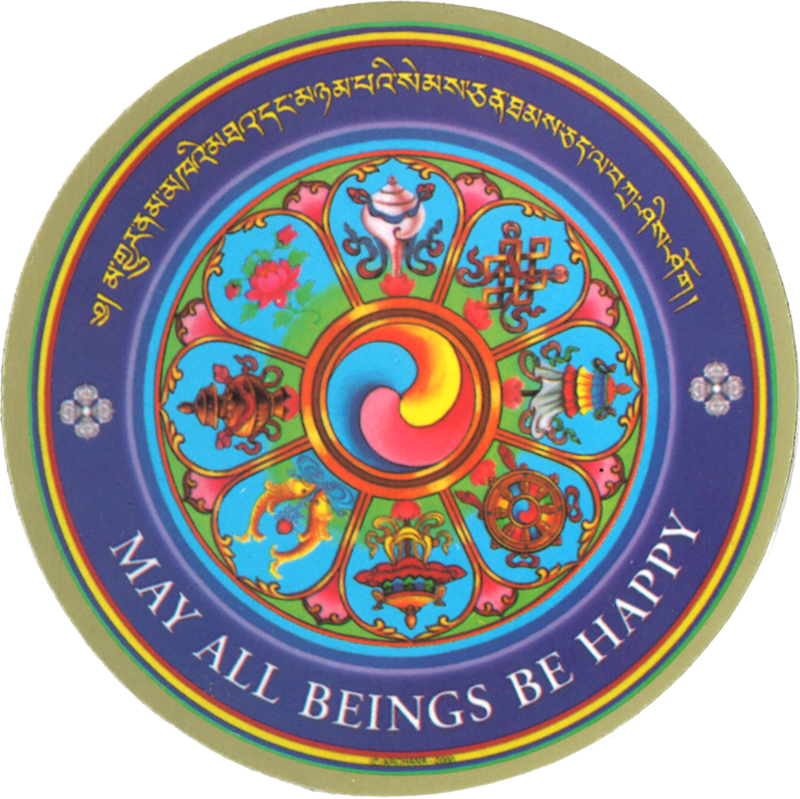 starts at the Shanti Stupa which was built in 1985 to commemorate world peace and offers some of the most stunning views of Leh, the capital of Ladakh. The course veers west to Changspa, loosing elevation as one proceeds towards the Army Officer’s mess and Army general hospital and the Leh Airport. 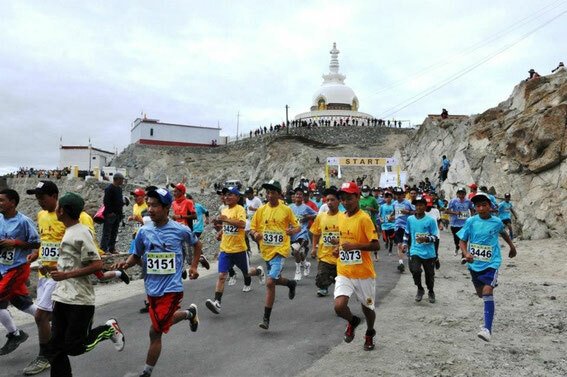 Runners then go past the Hall of fame from where the race heads for Spituk Gompa. From here onwards, the course turns South passing through the Spituk village along the true right bank of River Indus to arrive at Choglamsar (approx 6kms). 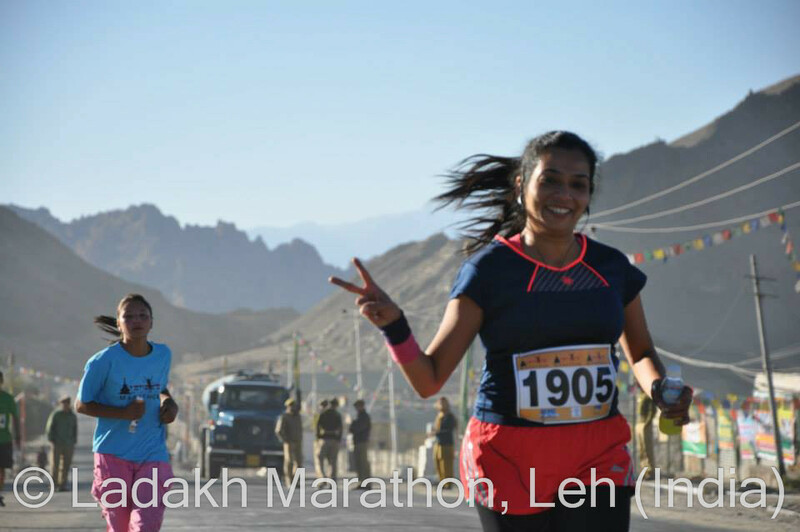 From here the course meets the main Leh-Manali highway and it is an uphill run for about 4kms, running past Tibetan Refugee settlement, Indo-Tibetan Border Police and HIMANK headquarters. 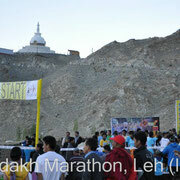 For the final 2.5kms the trail flattens as we enter Leh town to finish at Ladakh Public School grounds. This race starts at the Shanti Stupa which was built in 1985 to commemorate world peace and offers some of the most stunning views of Leh, the capital of Ladakh. 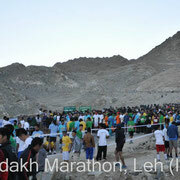 The course veers North towards the Tisura Stupa, a structure that dates back to the 16th century which is now in ruins. Runners then go past a sanctuary for local donkeys and then towards the Gompa Village before they turn east towards the Lamdon School. 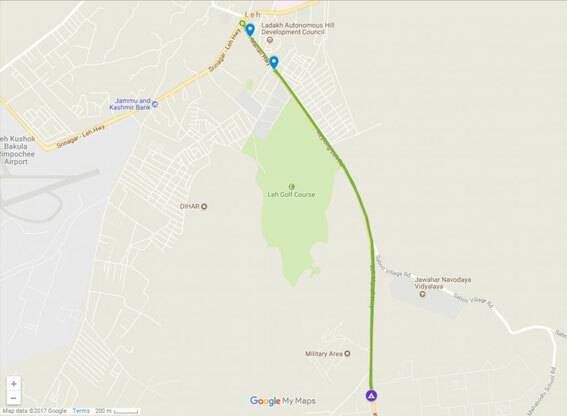 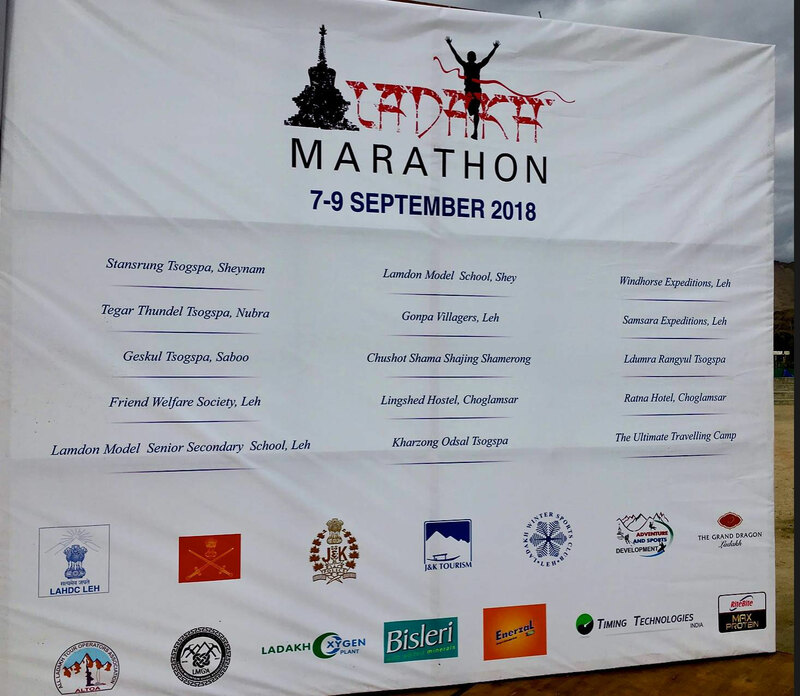 The course from here is all downhill from Lamdon School, passing through the Women’s Alliance and the Leh market and taking the Sheynam Road to finish point at Ladakh Public School grounds. The Khardung-La Challenge begins at Khardung village (3975mts/13,042ft) with the route involving a gentle but steady climb to the Khardung-La top, one of the world’s highest passes and goes till 5370mts/17,618ft before the route descends to Leh, the capital of Ladakh 3524mts/11,562ft. The Khardung-La Pass is the high point along the route and the world’s highest motorable road. 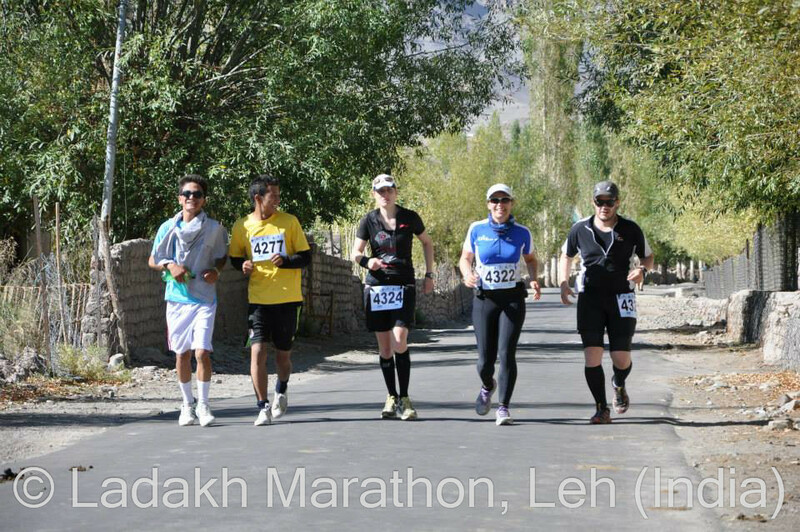 Runners get spectacular mountain views of the Karakoram and Stok Ranges, running past mountain villages and summer pasture land of yaks of the Nubra Valley and North Pullu. From the top of Khardung-La it’s all downhill to Leh. 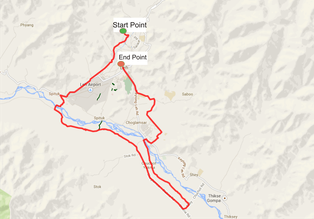 The distance is 72Km. 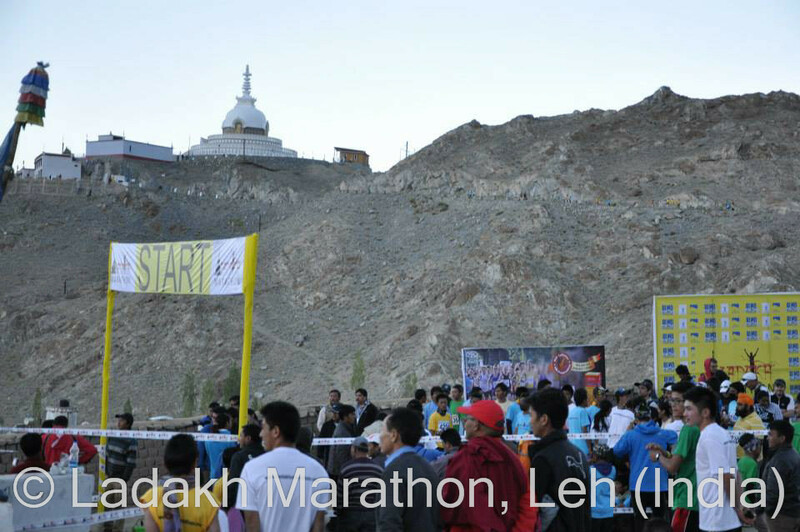 This race starts at the Shanti Stupa which was built in 1985 to commemorate world peace and offers some of the most stunning views of Leh, the capital of Ladakh. The course veers north towards the Tisura Stupa, a structure that dates back to the 16th century which is now in ruins. Runners then go past a sanctuary for local donkeys and then towards the Gompa Village before they turn east towards the road to the Khardung La pass and Nubra valley. 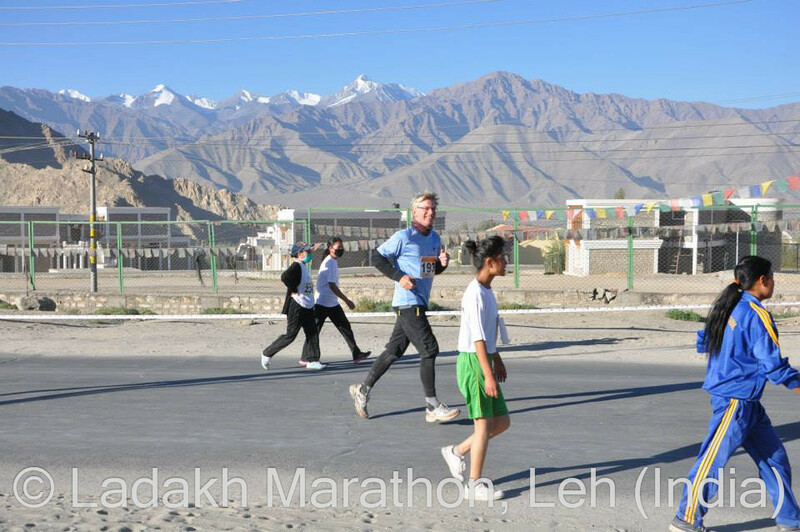 There’s a bit of a flat section along a stretch of road overlooking Lamdon School but after that it is all downhill from the Tsemo bend towards Skampar, the polo ground and taxi/bus stands before the finish point at the Petrol Pump. 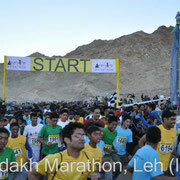 The course begins at the 10 km start and then continues along the Petrol Pump towards Housing Colony. 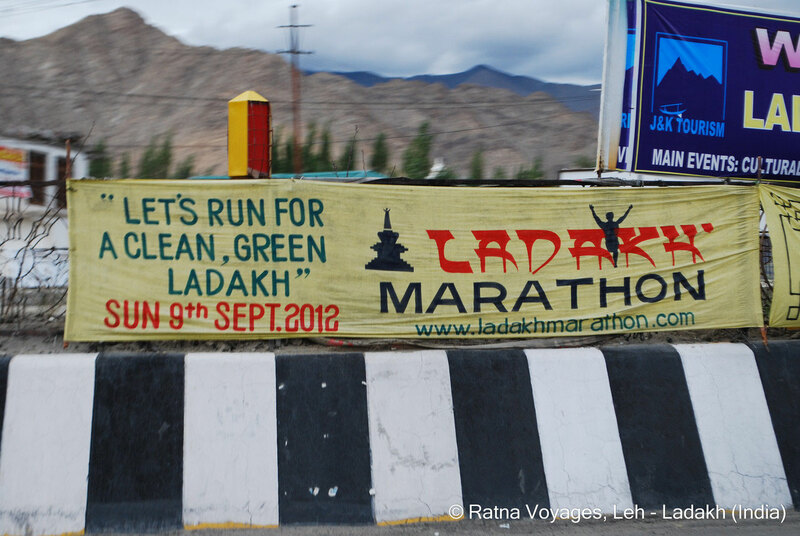 After TCP the course veers left and follows a newly built road to the Dalai Lama’s summer residence in Ladakh. 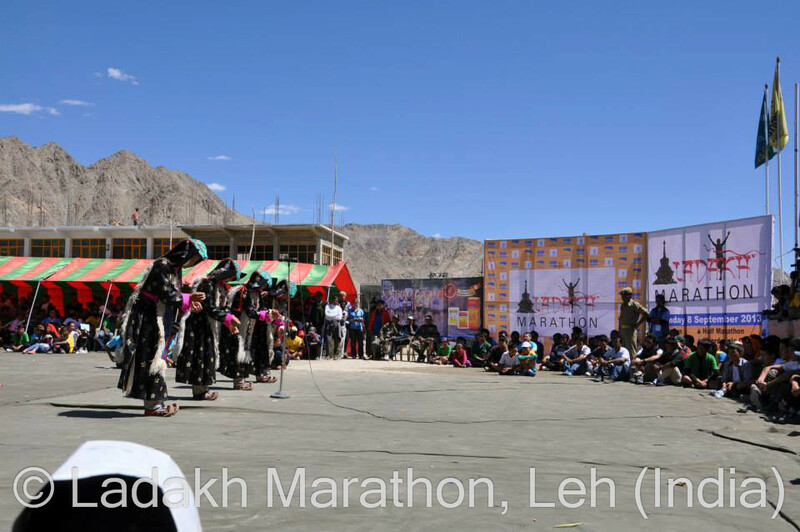 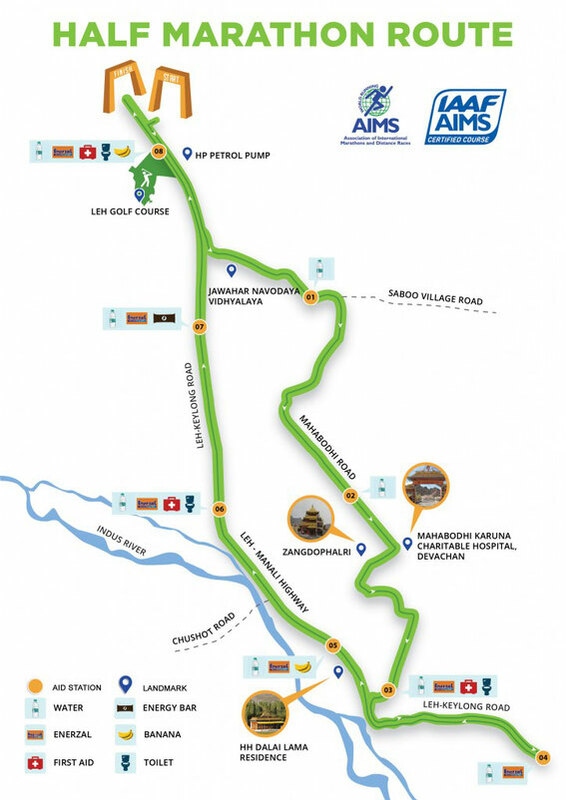 Runners will turn right on the main Leh-Manali Highway and go past the Tibetan refugee settlement, the Indo Tibetan Border Police camp and HIMANK headquarters and then return to the Petrol Pump for the finish. 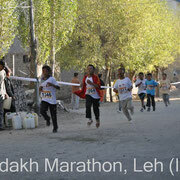 The Ladakh Full Marathon starts at the Petrol Pump on the Leh-Manali Highway and goes past the HIMANK headquarters, the Tibetan Refugee Settlement and the Dalai Lama’s summer residence in Ladakh. 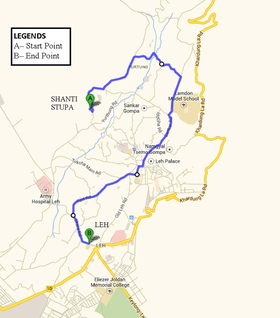 After Sindhu Ghat the course heads towards and through Shey Village and the famous Shey Palace. 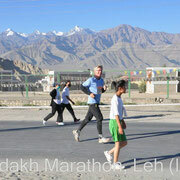 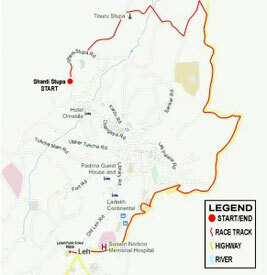 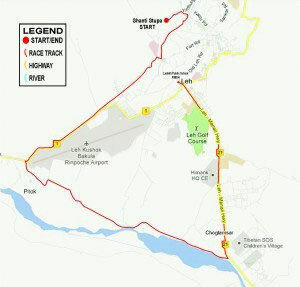 Runners will go past the Druk White Lotus School and cross the Shey bridge over the Indus River to Chushot Shama. There is a flat section to Chushot Yokma and Spituk Bridge from where it is all uphill to the Petrol Pump past the Spituk monastery, Leh Airport, military base and Zorawar Fort. 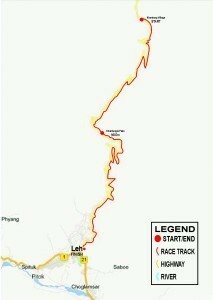 The Khardung-La Challenge begins at Khardung village (4267mt/14,000 ft) with the route involving a gentle but steady climb to the top of Khardung-La, the world’s highest motorable road (5602mt/18,380 ft) before the route descends to Leh, the capital of Ladakh at 3524mt/11,562 ft. 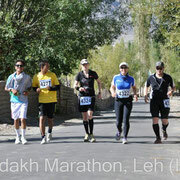 Runners pass mountain village and summer pasture land of yaks in Nubra Valley and North Pullu. 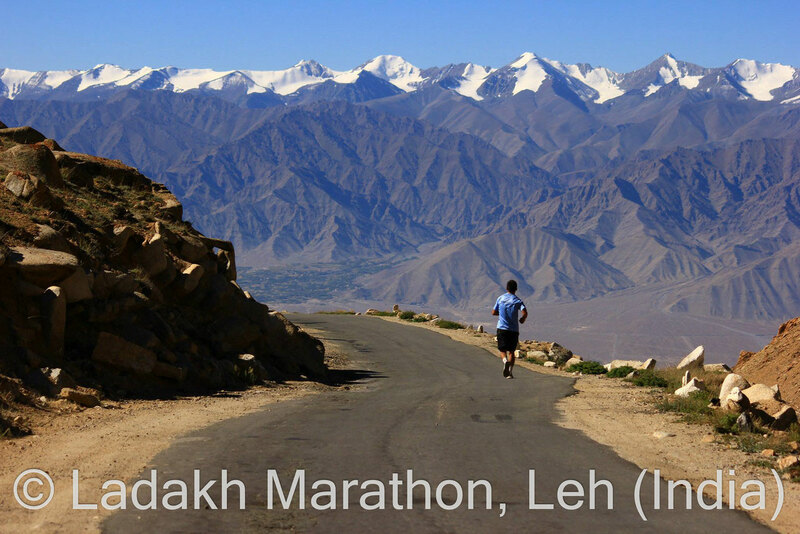 From Khardung-La top the course is all downhill to Leh.